The Station at Rome is in the basilica of Holy Cross in Jerusalem, one of the seven principal churches of the holy city. It was built in the fourth century, by the emperor Constantine. The emperor’s mother, St. Helen, enriched it with most precious relics, and wished to make it the Jerusalem of Rome. The Basilica of Santa Croce dates from the reign of Emperor Constantine, whose imperial palace, palatium Sessorianum, was the official residence of his mother, Helena. She is said to have converted part of her palace into a basilica to house the True Cross which she had brought back from the Holy Land. A medieval renovation left us the campanile, the columns that divide the nave and aisles, and a cosmatesque floor. Most visible today is an 18th century modernization with rebuilt façade, large oval vestibule, and reconstructed sanctuary with a green basalt altar containing the relics of Ss. Anastasius and Caesarius. The niche on the left of the apse frontal was the Chapel of the Relics of Our Lord’s Passion where they were sealed up for safety during the Middle Ages. Now there is a modern (1930) Chapel of the Relics, where Saint Helena’s sacred treasures are preserved: a large relic of the True Cross, a nail from the Cross, a thorn from the Crown of Jesus, and a large piece of the cross of the Good Thief. There is an interesting story, depicted in the 15th century apse frescoes, of how Helena discovered the True Cross. When visiting the Holy Land and gathering precious relics, she had the foot of Mount Calvary excavated and then placed invalids from nearby Jerusalem on the wooden beams unearthed. When one beam healed the sick, she knew it to be from the True Cross. Also in this church is the first part of the INRI sign that Pilate had nailed to Our Savior’s Cross, with the inscription (in Hebrew, Greek, and Latin) “Jesus of Nazareth, King…” The relic was found in 1492, hidden in the wall of the basilica behind a mosaic that was being repaired, presumably to guard it from raiding armies. 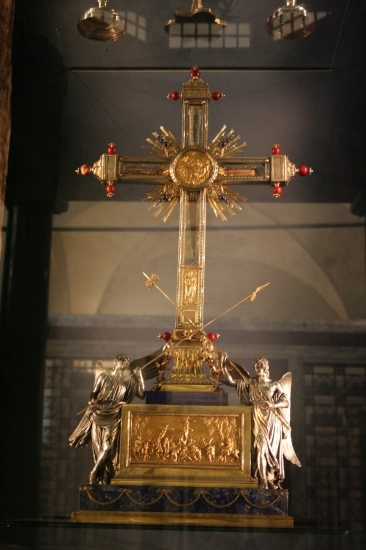 We know that such a relic was venerated in the courtyard on Calvary in Jerusalem before St. Helena’s visit. Interestingly, the Greek and Latin words are written, like Hebrew, backwards. Some scholars thus believe that the inscription was written by a Hebrew used to writing in that direction. It does seem unlikely that a medieval forger would do such a thing. On either side of the sanctuary, a sloping walk leads down to the original level of the Constantinian basilica. The left chapel is dedicated to St. Gregory and contains a 17th century Pieta flanked by 14th century statues of Peter and Paul. On the right is the chapel of St. Helena, possibly her original private chapel where the relics were first kept. The altar here is reserved for the Pope and the Cardinal Titular. On this Sunday of Lent, Laetare Sunday, the Pope used to come here not only to hold the Station Mass but also to bless the Golden Rose, a traditional symbol of the joys of heaven bought for us by the Passion of Christ. The flower was of solid gold, with diamond decorations and usually presented to a notable Catholic prince. Though a 900 year tradition, today the Rose is sent frequently, but not annually. Past recipients include Henry VI of England, James III of Scotland, and Henry VIII of England, who received it three times! Santa Croce is one of the three Minor Basilicas of Rome. Location: At the Piazza di S. Croce in Gerusalemme, east of St. John Lateran. with deepest reverence and with faith unwavering.